I love spending time in my kitchen cooking and baking new recipes. It’s fun to experiment. However, one thing I despise is the cleanup. I tend to make a huge mess every time I’m cooking. I try to clean as I go along but it never works. In the end, it’s an embarrassing mess and one that makes me tired just looking at. I always dread the cleanup. Does the mess ever stop me from making certain recipes? The answer to that is a yes. When I’m tired and have lots to do, I don’t want to make anything elaborate because I know how much time I’ll be spending on cleanup. I will say though that cleanup time has shortened quite a bit since we purchased a dishwasher last year. It’s so much easier tucking the dirty dishes away and letting the dishwasher do all the hard work. 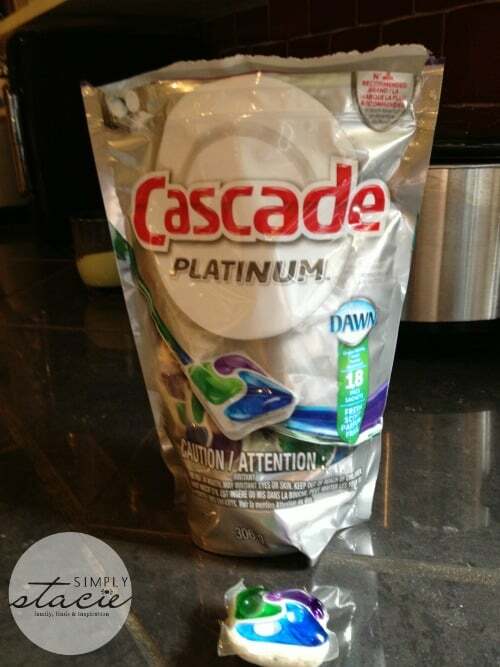 One of the brands of dishwasher detergent I use is Cascade Platinum. In fact, the inside of my dishwasher even mentions using the Cascade brand! I find it works really well on getting off stuck on food and makes my dishes clean and sparkly. I get really annoyed when dishes come out dirty after running a load in the dishwasher. Thankfully that rarely happens when I use Cascade Platinum. 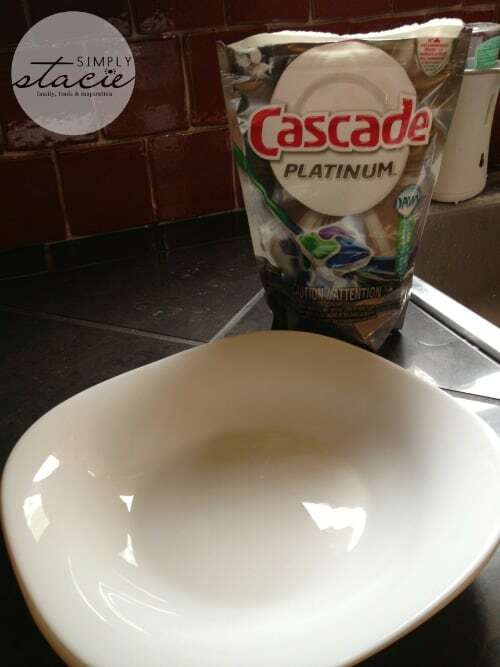 Cascade Platinum Pacs uses a premium, advanced triple action formula to clean dishes. It even scrubs away food that’s been left sitting on the dishes for 24 hours. There’s no need to pre-wash dishes (which I never do anyways!) and it also has the grease-fighting power of Dawn. When all is said and done, dishes are clean, residue free and dry. It comes in Fresh and Lemon Burst Scents. I also recently learned that Cascade Platinum has partnered with Food Network Canada’s Michael Smith. He is the host of the show, Chef’s Michael’s Kitchen. 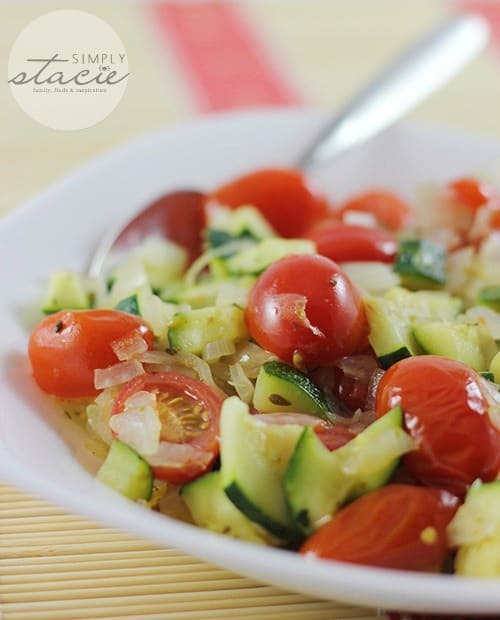 I thought it would be fun to try a recipe from his book, Back to Basics and use my Cascade Platinum Pacs for cleanup. 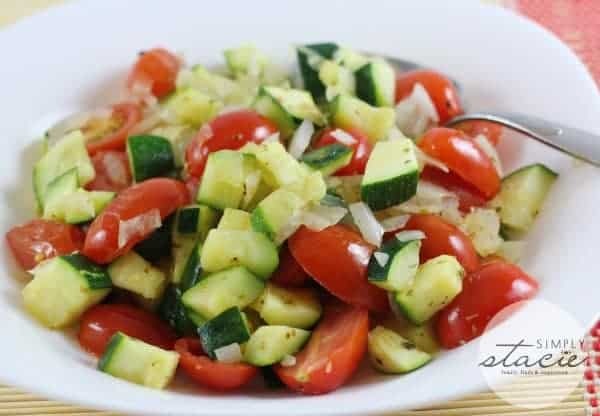 I made Pan-Roasted Zucchini and Cherry Tomatoes. It was bursting with flavour and so good! It’s also very healthy too! In terms of the mess, I made out ok. It took me less than five minutes to have the kitchen cleaned and all the dishes loaded in the dishwasher. Cascade Platinum worked its magic and my dishes came out sparkly clean! Macaroni and Cheese or Chicken Kiev. Chicken wings in the oven. I also hate cleaning lasagna pans too! And greasy broiler pans after making bacon or sausage. I hate to clean up after my kids cooking … they get creative and I get the dishes ! I hate cleanup from lasagna….it’s always baked on so bad!!! I have a lentil and brown rice casserole that I love, but don’t love cleaning up the baked cheese afterwards. Lasagna for baked on mess – and fish and chips for oily mess. Everything! My dad always said I could mess up everything in the kitchen to boil water! Thanks for this giveaway! I have a favourite casserole dish that I use for oven-baked ribs, which is really a challenge to clean well. Anything that is baked with cheese especially lasagna. Any kind of baked pasta is tough. My favourite is lasagna, too!!! I love to make bacon, lettuce and tomato sandwiches for lunch, but I hate cleaning the microwave bacon rack.